Furniture company Swedese and furniture design school Malmstens Linköping University are collaborating on the development of a chair for assembly halls. The results will be presented in an exhibition in the Greenhouse (stand C20:49) at Stockholm Furniture Fair 2018 and in front of Swedese’s stand in Hall A.
Swedese has a long history of furniture production in Sweden. Ever since founder Yngve Ekström’s time, the company has focused on a long-term approach, creating sustainable production and having a passion for design and aesthetics run through the entire business. Swedese has now entered into a collaboration with Malmstens Linköping University, where third-year students on the Furniture Design programme have been tasked with developing a chair to meet the seating needs of the future. Research suggests that spending increasing time seated during long working days of meetings, lectures or conferences will create widespread health problems in the future. The goal for the design students was to develop a chair for large volumes in public environments that can stand up to heavy wear. 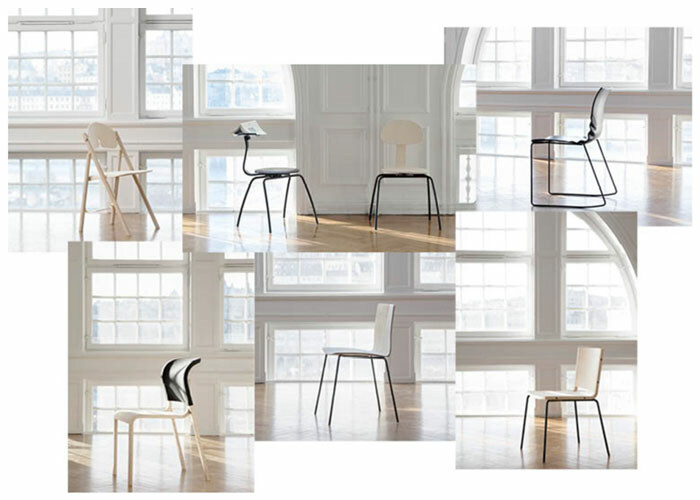 A chair with a slim profile and low weight that can be connected together and stored by stacking or hanging it up. Armrests and a writing desk were other key criteria in the brief. The material had to be wood or a combination of wood, metal or some other material. The chair was also required to be inviting, comfortable and fully in line with Swedese’s characteristic look. “In their final year, the students always carry out a collaborative project with a furniture manufacturer. Working on a real-life project with a tight brief sets the designers up well for their entry into the furniture industry. In this year’s collaboration with Swedese, the products show creativity, innovation and excellent awareness of materials,” says Leó Jòhannsson, university lecturer and head of the Furniture Design programme. Seven students took part in the project, which involved visiting Swedese in Småland in the autumn to learn about the company’s strategy and vision, and the depth of knowledge that can be found in the furniture factories in Vaggeryd and Äng. Over the course of the project, the students produced their designs, developed the concept and produced a prototype that was then presented to Swedese, as part of a close collaboration with regular meetings and feedback. The result of the collaboration is a fantastic collection of six chairs, each one unique but sharing a common thread of innovation, creativity and ingenuity. The chairs will be presented in the Greenhouse (stand C20:49) at Stockholm Furniture Fair and in front of Swedese’s stand in Hall A. This design collaboration is undoubtedly going to mark the beginning of a future career for these young furniture designers. Malmstens Linköping University (formerly Carl Malmstens Furniture Studies) was founded in 1930 by Carl Malmsten. In 2009 the school moved to Lidingö outside Stockholm, and it has made a real name for itself in the furniture industry. Campus Lidingö trains many of the future big names in furniture design. The school is increasingly making an appearance on the international stage. For example Malmstens Linköping University was represented at the China International Furniture Fair, Shanghai 2017. Swedese is a family-owned Swedish furniture company founded in 1945 by Yngve Ekström and his colleagues. Today the company is owned by Anna Johansson and Julio Patino. All their furniture, for both domestic and professional environments, is manufactured in Vaggeryd and Äng using top-level craftsmanship that has been developed over more than half a century. Thoughtful and strong designs are translated into furniture with minimal environmental impact that should last at least one lifetime.